I love summer, I always have done. Not only is it the only couple of months a year I’m not moaning about the cold or dressed in enough layers fit for an Eskimo, but it brings the perfect excuse for an ice cream and on my recent trip to Spain there was no holding back. Me and my aussie friend Mel flew to the south of Spain for a long weekend to lap up the sunny delights of a small town situated close to Torremolinos, part of the Costa del Sol. 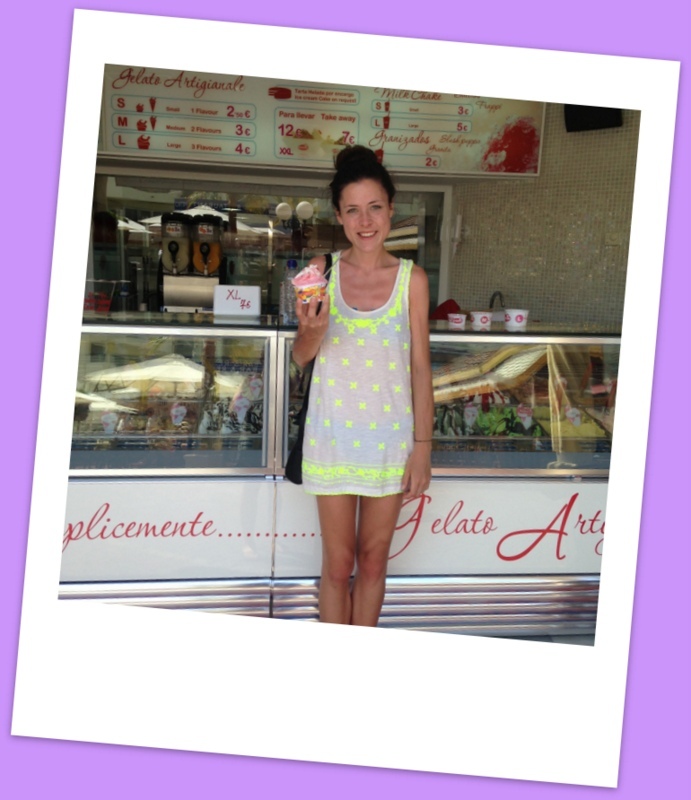 As on holiday, it was essential I had at least one ice cream a day and doing so, I thought I’d share them with you. 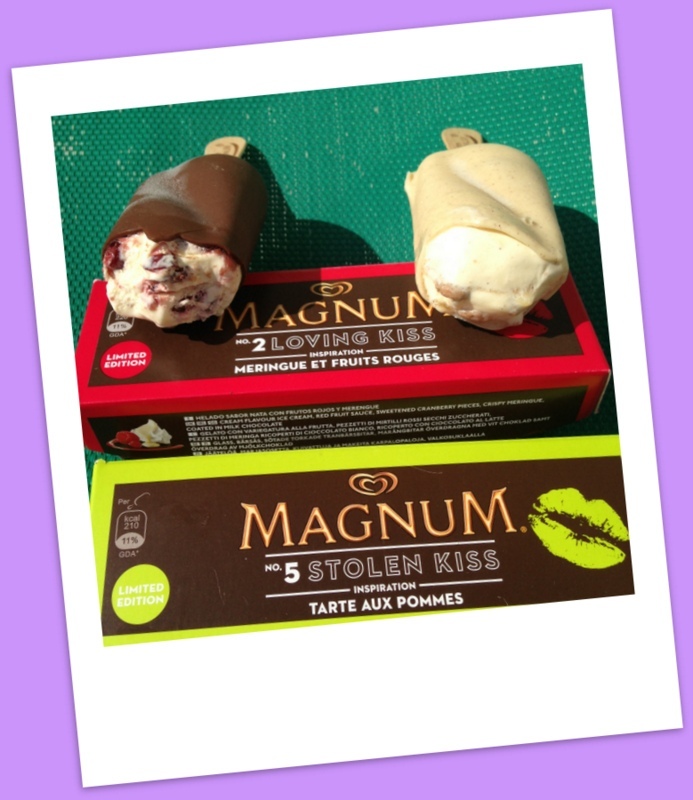 First up was one fifth of the new Limited Edition Five Kisses range from Magnum. I had heard about these from fellow food blogger Chris Pople of Cheese & Biscuits but had not been lucky enough to find them in UK shops before my trip to Spain. There are five kisses in total (Tarte Aux -Pommes; Crème Brûlée; Gateau Au Chocolat; Tiramisu; Meringue Et Fruits Rouges) and can be found in supermarkets as part of a multi-pack of five miniatures and in smaller stores selling single full-sized ice creams. After falling in love with Ben & Jerry’s ‘Oh My! Apple Pie’ flavour ice cream I decided to choose Tarte Aux Pommes as this flavour translates to ‘Apple Tart’ so somewhat similar. The ice cream was made up of creamy vanilla flavoured ice cream with a thick intense apple sauce surrounding one half. The apple sauce taste similar to that found in Mr Kipling’s Apple Pie which played a huge role in my childhood treats. 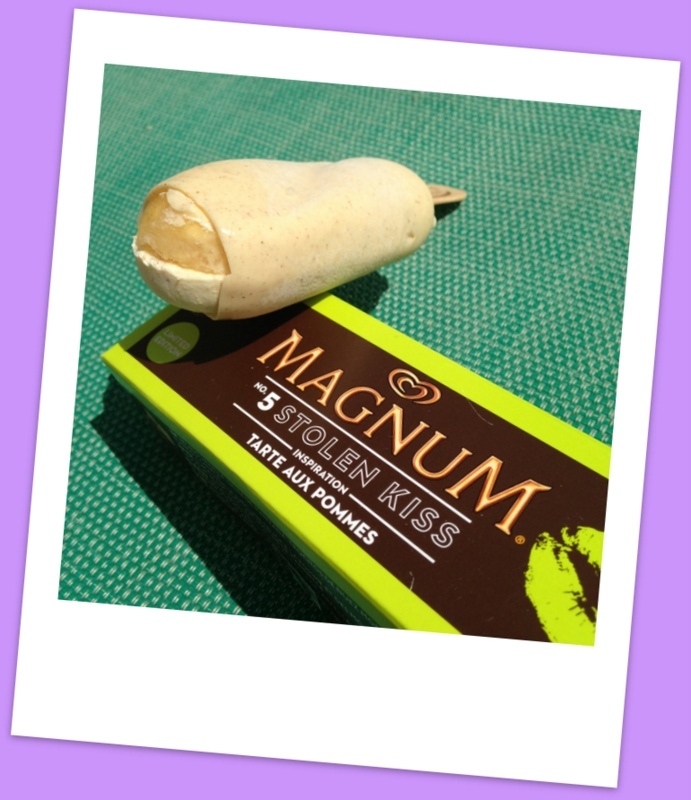 Holding it all together, the ice cream and apple sauce was encased in smooth white chocolate – sound delicious? It doesn’t stop there! Hidden throughout the ice cream was a generous helping of pastry tart pieces – truly wonderful! The size of the Magnum is slightly smaller than the norm which made it lighter and therefore, more refreshing and enjoyable. I can’t wait to get my hands on another! One scoop of Ferrero Rocher and one scoop of Strawberry Yogurt gelato! Day two involved a walk to the local marina which had been packed full of people eating ice cream the previous evening. We decided to pick some up from the main gelato parlour Gelato Artigianale with myself opting for a double scoop of Ferrero Rocher and Strawberry Yogurt flavour. Unfortunately the Strawberry Yogurt was so overpowering and tasted what I often refer to as ‘mass produced’, with un-natural flavouring. I tried to scoop this flavour into the bin which turned out to be a rather messy and regrettable affair. The Ferrero Rocher flavour was much nicer and contained large swirls of thick chocolate which tasted of Nutella plus pieces of wafer. Although nice, my stomach didn’t agree and the mix of heat and rich cream proved all too sickly. Top tip: don’t eat chocolate and cream in the blazing midday heat! Frozen Yogurt with white chocolate coconut sauce with wafer pieces plus yogurt coated peanuts plus Chips Ahoy cookie pieces! After the disappointment of day two’s ice cream, we decided to pick up a less creamy and slightly healthier alternative on day three. We visited llao llao on the beach front for frozen yogurt (FroYo) and both chose a topping of white chocolate and coconut sauce which contained pieces of wafer biscuit (I also opted for second topping of caramel biscuit crumbs!) The sauce was incredible and oh-so-refreshing. It was sweet but not at all sickly and the frozen yogurt was some of the freshest I’ve ever tasted. We were so impressed that we returned the very next day for the same again with an additional topping of yogurt coated peanuts and Chips Ahoy cookie pieces, both I found added no value to the already delicious white chocolate and coconut sauce. 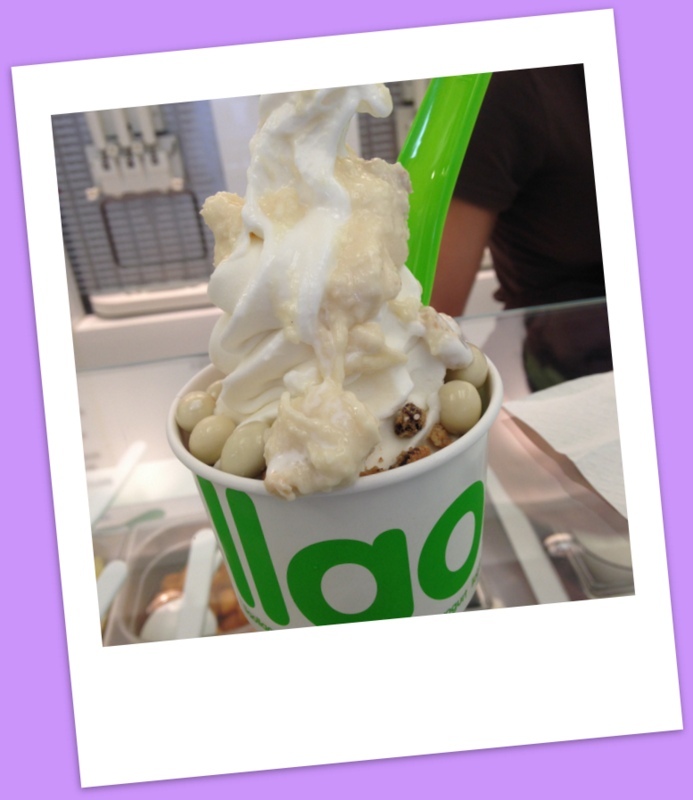 Spanish born llao llao have advised that they are soon to open in London so I’ll make sure I pay them a welcoming visit! Sadly, our holiday was up and it was time to head back to the UK. 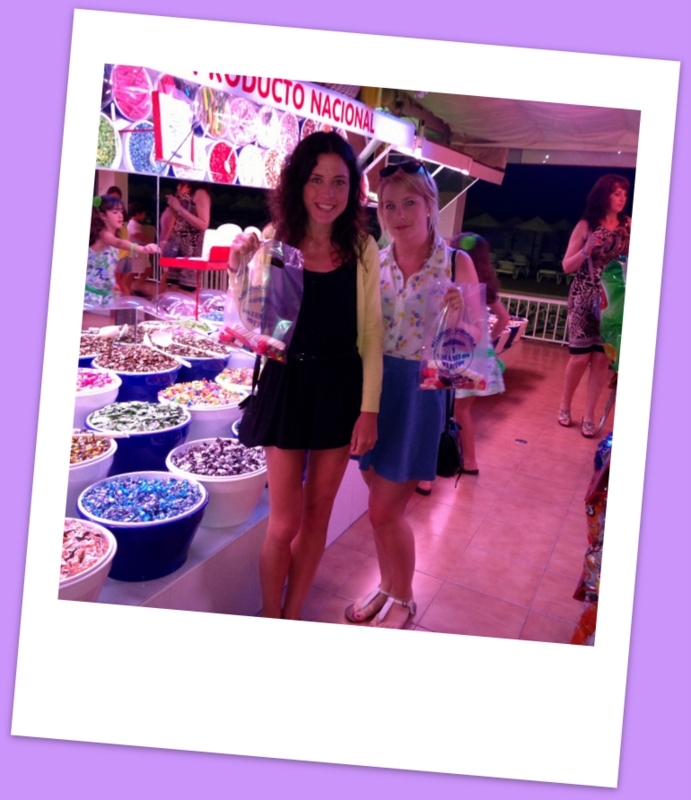 Mel and I had a fantastic holiday with equally as fantastic frozen treats with the FroYo taking the number one spot. 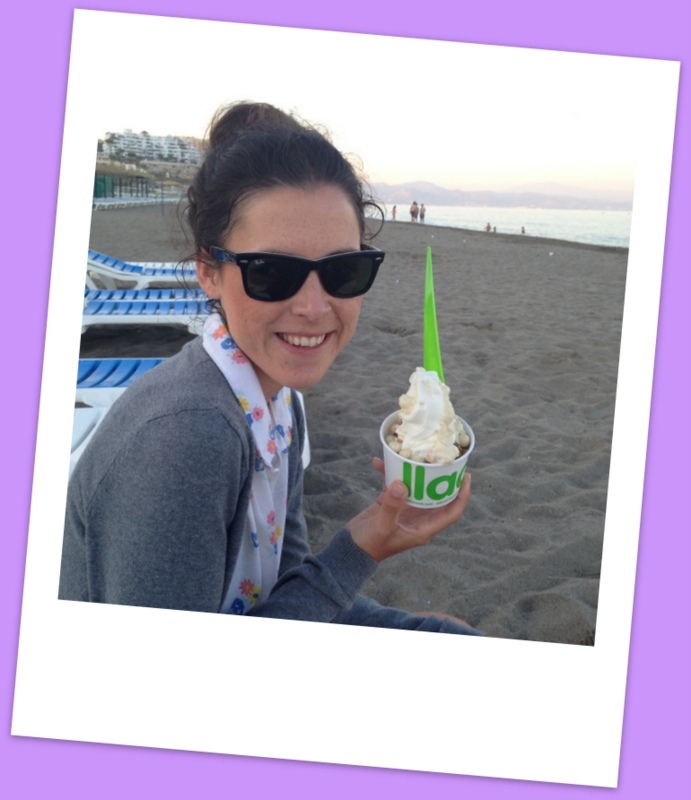 You can read more about my FroYo adventures from last year’s trip to Spain here. Let us know if you’ve had a particularly good ice cream whilst abroad or at home this summer, as we continue our search for the world’s best sweet treats!